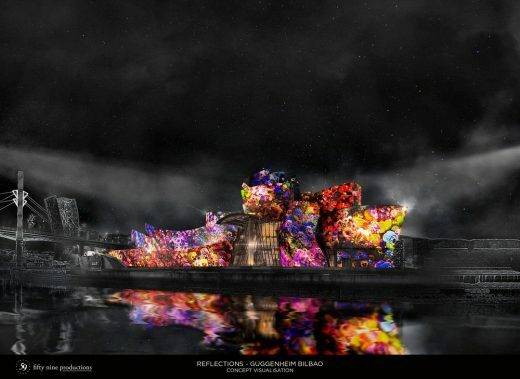 Reflections, the extraordinary mapping event on Frank Gehry’s building took place from 11 to 14 October 2017. Reflections included references to some of the most iconic artworks in the Museum Collection. 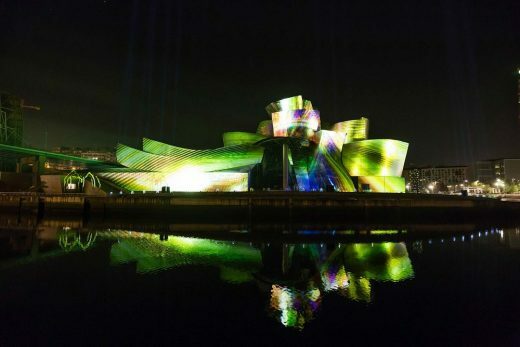 From 11–14 October, the shimmering exterior surfaces of Frank Gehry‘s Guggenheim Museum Bilbao was transformed into a unique, sensory experience in Reflections, a spectacular projection mapping commission by 59 Productions, to celebrate the museum‘s 20th Anniversary with the citizens. 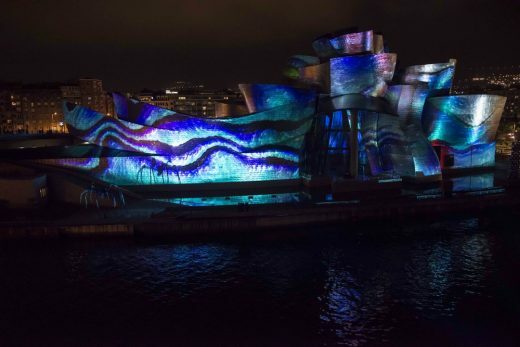 A 20-minute show – combining music, light and projection – sponsored by the City of Bilbao, the Provincial Council of Biscay, and Iberdrola, Reflections was played on a loop across four evenings, and was anticipated to draw in crowds of more than 200,000 spectators as one of the major events of the Museum‘s celebration year. Some of the most iconic artworks that surround the Museum building had a hand in the transformations. The metalwork became reflective and spherized like Anish Kapoor‘s sculpture Tall Tree and The Eye ; Louise Bourgeois‘ giant spider Maman sent its huge shadow skittering across the building; and Jeff Koons‘ flower-covered Puppy propagated flowers that bloomed across the building‘s surfaces. 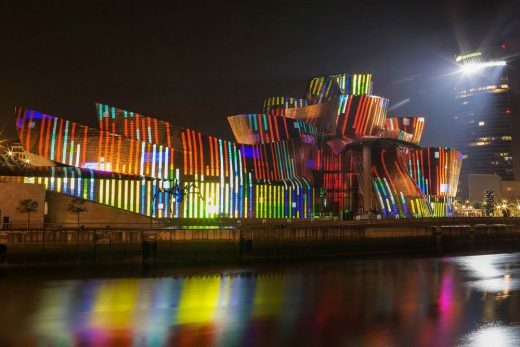 Using cutting-edge technology, Reflections turned the north-facing facades of the Museum into a canvas for bespoke animations, celebrating two decades of cultural transformation in Bilbao. 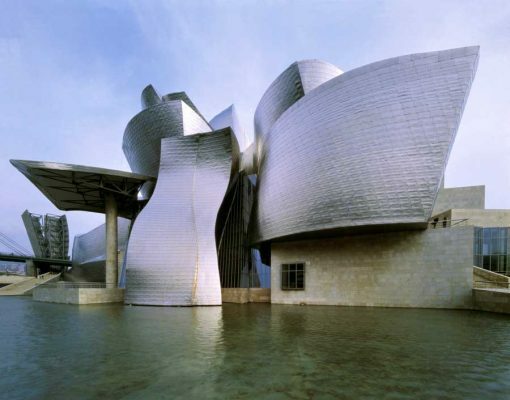 Audiences witnessed the genesis of the building, represented in Gehry‘s now-iconic continuous-line sketch, and watched the (then) cutting-edge Catia computer modelling process devised for designing aeroplanes calculate the impossible curves and variations for the titanium cladding. 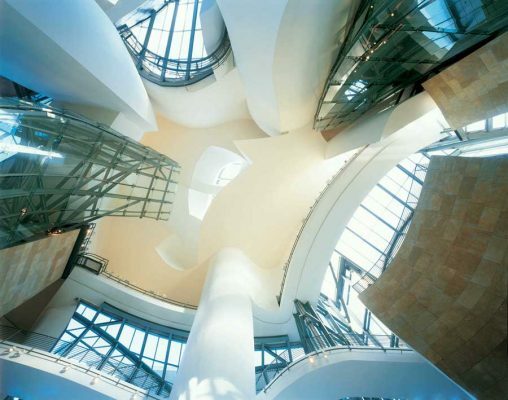 Architect Frank Gehry once said of his creation that “the randomness of the curves are designed to catch the light.” Reflections took his words as a provocation to explore the story of the museum through the medium of light and shadow, re-presenting its geographical environment to audiences. 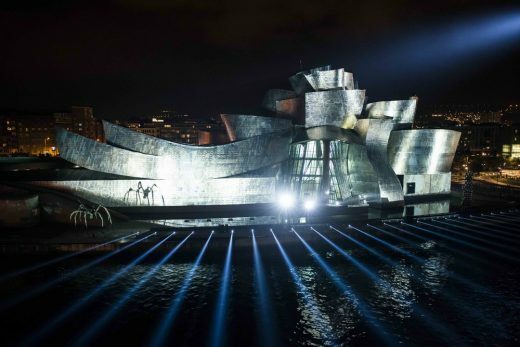 As Director General of the Guggenheim Museum Bilbao, Juan Ignacio Vidarte, said: ―It was very important for us to conceive an exceptional event to celebrate the Anniversary and share it with the people that are close to us: the citizens that we have so much to thank for. 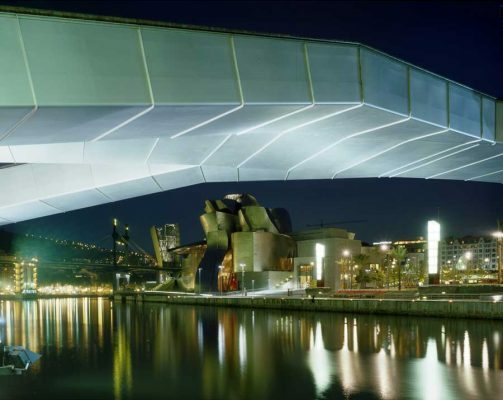 Working together, an extraordinary transformation has been possible in Bilbao conveying to the world the message of how art changes everything. Reflections will be a unique, once-in-a-lifetime show. 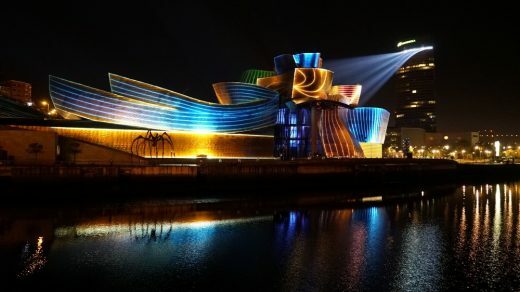 From 11–14 October, the shimmering exterior surfaces of Frank Gehry’s Guggenheim Museum Bilbao will be transformed into a unique, sensory experience in Reflections, a spectacular projection mapping commission by 59 Productions, to celebrate the museum’s 20th Anniversary with the citizens. 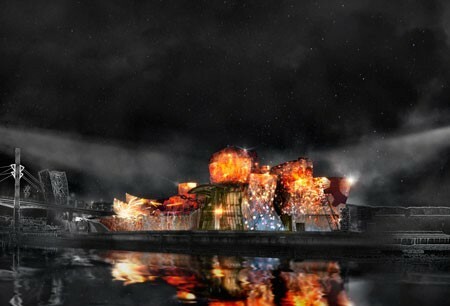 A 20-minute show – combining music, light and projection – sponsored by the City of Bilbao, the Provincial Council of Biscay, and Iberdrola, Reflections will be played on a loop across four evenings, and is anticipated to draw in crowds of more than 200,000 spectators as one of the major events of the Museum’s celebration year. Some of the most iconic artworks that surround the Museum building will have a hand in the transformations. The metalwork will become reflective and spherized like Anish Kapoor’s sculpture Tall Tree and The Eye; Louise Bourgeois’ giant spider Maman will send its huge shadow skittering across the building; and Jeff Koons’ flower-covered Puppy will propagate flowers that will bloom across the building’s surfaces. Using cutting-edge technology, Reflections will turn the north-facing facades of the Museum into a canvas for bespoke animations, celebrating two decades of cultural transformation in Bilbao. Audiences will witness the genesis of the building, represented in Gehry’s now-iconic continuous-line sketch, and watch the (then) cutting-edge Catia computer modelling process devised for designing aeroplanes calculate the impossible curves and variations for the titanium cladding. 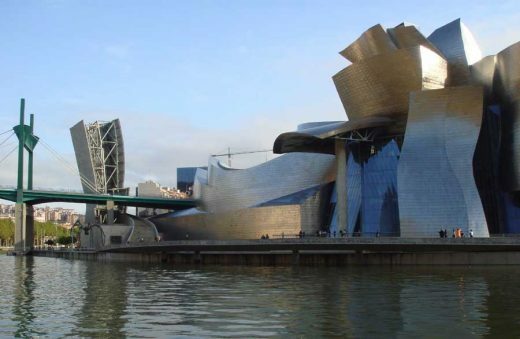 A spectacular public event has been announced by the Guggenheim Museum Bilbao to celebrate the 20th Anniversary of its opening. 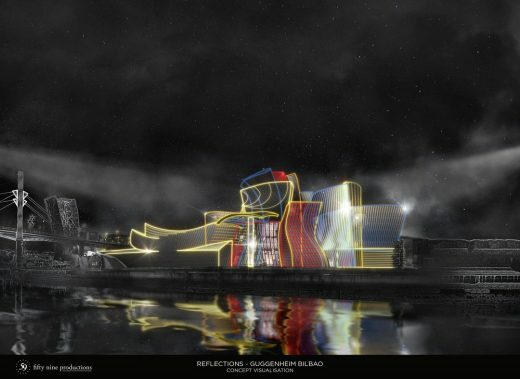 Reflections will be an open, free-admission event made possible thanks to the collaboration of the City of Bilbao, the Provincial Council of Biscay, and Ibedrola. 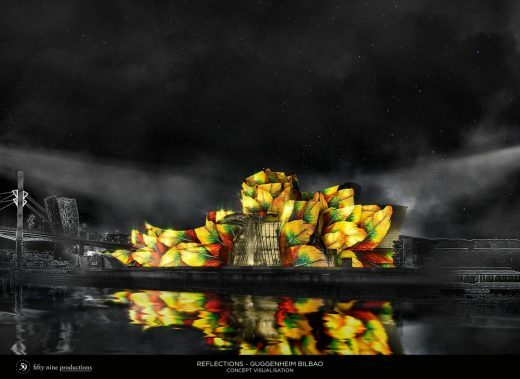 Designed specifically for the occasion, Reflections — a large-scale projection mapping event — has been conceived as a unique, sensory experience for both locals and visitors alike. This will be the final event of the celebration year, which is being marked by a special art programme and numerous cultural activities. From 11-14 October, Frank Gehry’s iconic building will be turned into an impressive public artistic intervention by Tony Award-winning video artists, 59 Productions. 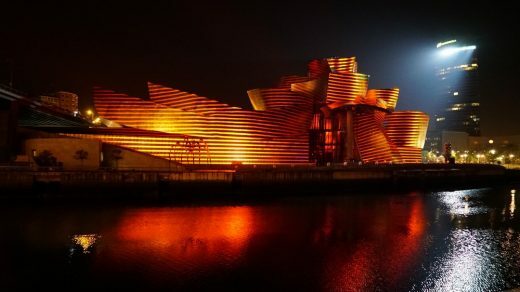 The Museum will see its distinctive titanium curves and soaring glass atrium used as a vast canvas for a bespoke projection-mapping event for more than 200,000 spectators, free of charge. 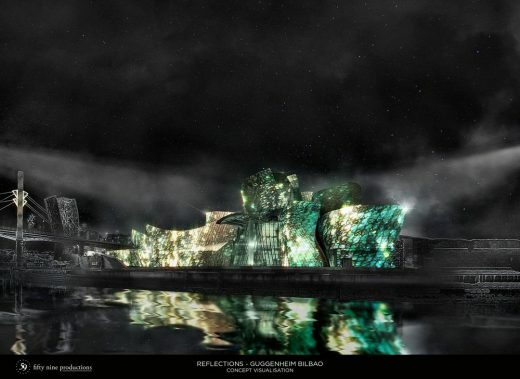 Guggenheim Museum Bilbao 20th Anniversary Celebration by 59 Productions. 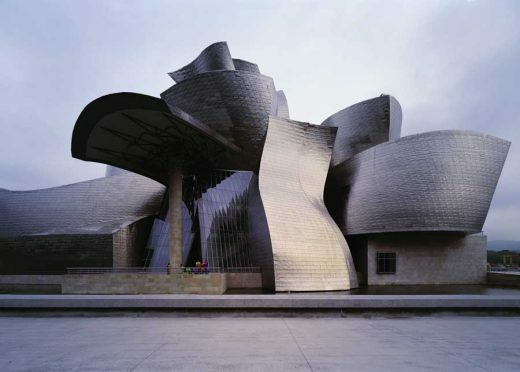 “The randomness of the curves are designed to catch the light”, Frank Gehry on Guggenheim Museum Bilbao. 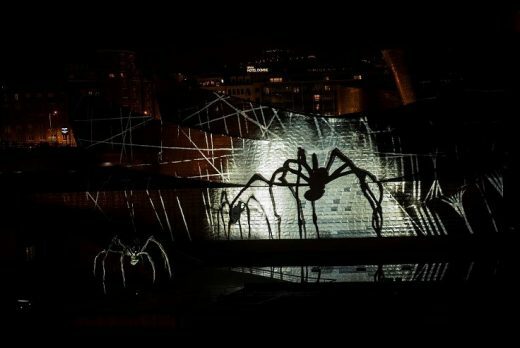 Using cutting-edge technology, the 20-minute animated artwork will be set to an original score and will trace two decades of history and creativity in Bilbao. 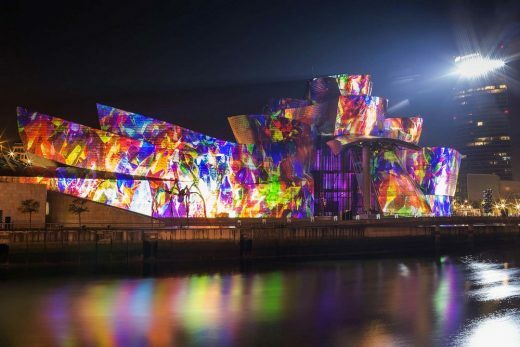 Inspired by this rich history alongside Gehry’s visionary design and lifelong preoccupation with light, texture and movement, the projections will transform his shimmering architectural masterwork and bring art to life in an unmissable iridescent celebration of the people and city of Bilbao. Reflections is the latest work from the multi award-winners 59 Productions, the team behind the video design of the Opening Ceremony of the London 2012 Olympic Games. Building on a decade of experience making theatrical work for some of the world’s greatest venues – including the National Theatre and the Royal Opera House in London, New York’s Metropolitan Opera and the Salzburg Festival – the Company has more recently become renowned for creating spectacular public artworks, projection-mapping some of the world’s most iconic buildings including the Sydney Opera House, Edinburgh Castle, Hampton Court Palace and the United Nations Headquarters in New York. Leo Warner, Director and founder of 59 Productions, said: “This extraordinary commission – to celebrate the building and the institution which played such a significant part in transforming the great city of Bilbao is without doubt one of our most exciting to date. 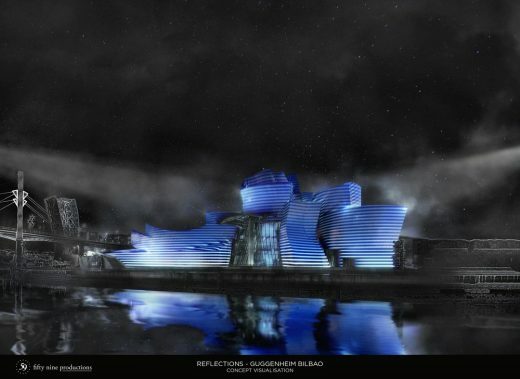 Gehry’s iconic building presents technical challenges and creative opportunities we’ve never faced before when creating a projected artwork. 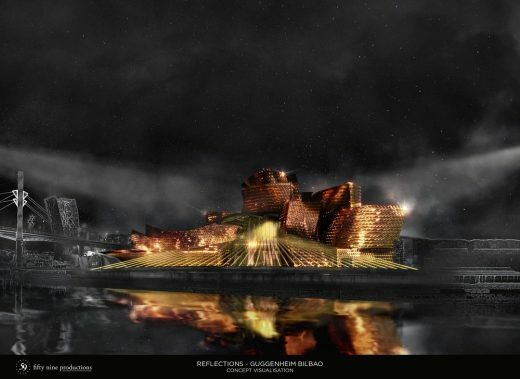 We will be using sound, music, light and projection to create a unique piece of theatre in which the building itself is the hero character”. 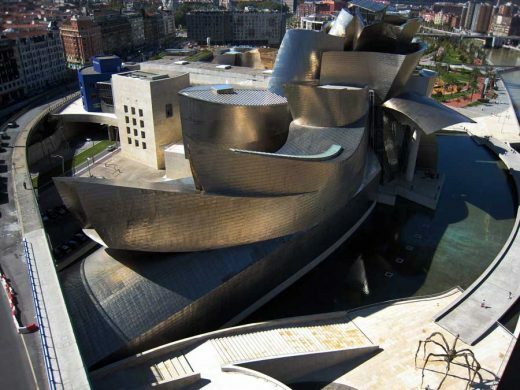 The Guggenheim Museum Bilbao is proud to announce a special programme of events to celebrate the 20th anniversary of its opening. 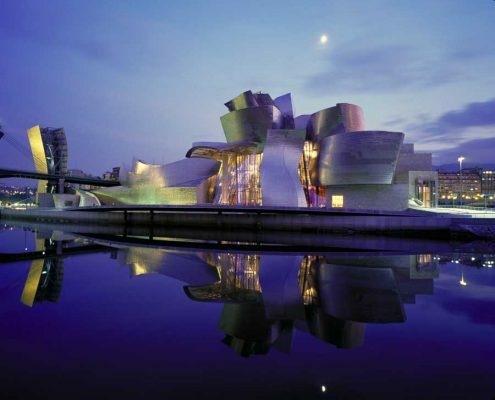 The Museum will host a series of special activities and standout exhibitions to commemorate and consolidate the institution’s leading position in the international art scene and its commitment to local communities and the artistic heritage of Bilbao. Twelve months of special programming will culminate in a major celebration of events in October 2017 to mark the anniversary of the opening, with details to be announced. 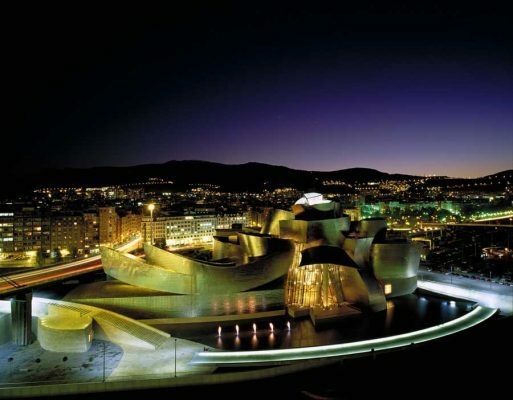 The Anniversary will be commemorated in all the Museum’s activities from October 2016 through October 2017 under the concept “Art Changes Everything,” a slogan inspired both by the major changes that the city of Bilbao and its residents have lived since the Museum opened, and the transformational capacity of art.